When girls play ball and don’t score! A couple of weeks ago, a very good friend came home and began talking to me about her daughter and a problem in school. The class 9 question paper required them to write an essay on gender equality. This girl had written an essay about how when she first thought about it, she felt that boys and girls were equal and that she had not really experienced any such inequality. But on second thoughts she realized that there were inequalities, but not apparent or visible. She studies in a co-ed school. She wrote about how when the boys play football, the girls are asked to ‘go off’ and play basketball. This, according to her, was an issue of inequality. She also wrote about how they never get selected for football teams and that even otherwise, there were very few women’s football teams. This, she identified, as a clear case of gender inequality for, as she rightly pointed out, there is nothing ‘masculine’ about football and wondered why it could not be played by both men and women when basketball could be. She then went on to state that in her class there were more boys than girls but that she was not sure whether this was an example of gender inequality in education. The rest of her essay was an excellent reflection on what caused these inequalities in general and biases and how they could be overcome. Her solution was a fervent plea for a change in mind-sets through education and awareness raising. My friend came to talk to me about this because this essay had been marked down by her teacher. She, on the contrary, felt that it ought to have been rated highly. Being a caring and conscientious parent, she met the teacher to find out what was ‘wrong’ with the essay and why it had been marked down. The teacher’s reply was illuminative to say the least! The teacher said that she had marked it down because the essay did not contain any arguments about either disparity in salaries between men and women or how only women had to pay dowries or about men cooking at home. The selection of an unusual theme to reveal hidden inequalities had not been valued by this teacher. My friend got upset and asked her why all these ‘arguments’ ought to be there, and why these ‘issues’ were so important, and seen as sacrosanct by her! She could not, for the life of her, comprehend the reason! That is when all was revealed. The teacher nonchalantly replied that the all-famous ‘KEY’ sent by the Board of Education (CBSE) had all these points listed! My friend saw red, but kept her cool and pointed out that from her daughter’s perspective and world view, none of these ‘arguments’ hold water. She pointed out that as the daughter of someone working in a University (my friend is also my colleague at my University) the young lady is aware that in India, (and this is definitely true of the government sector) men and women earn the same salary. What is even better is that this young lady knows that many men work as her mother’s junior colleagues and therefore actually earn less than her mother. She also told the teacher that in her family, the issue of asking for a dowry does not exist, and that her husband and son enjoy cooking and very often, the men handle all the kitchen work. As such, expecting her daughter to write about gender inequalities from these three ‘standard’ perspectives is not realistic. At this point, the teacher began to see light at the end of the tunnel. She mumbled that she could now begin to see why the ‘important’ issues had not been addressed and how from that particular student’s perspective, the gender inequality that she saw as existent in sports/football ought to be accepted and even valued. I have not made the effort to find out whether that particular essay was given a better grade or not! I assume that it has been given the credit it deserves, since my friend had taken the effort to discuss it with the teacher concerned. This is only one ‘success’ story, if it can be called that. But across our country, in millions of schools, thousands of teachers must be falling prey to such prescriptive scoring keys! The National Curriculum Framework, more than a decade ago, made a big case for the co-construction of knowledge and said that teachers must recognize and value such co-construction. An excellent example has been provided in that document about how a simple concept like transport systems will be interpreted differently by students based on their background. A student from a big metro city might think of it as cars and buses and trains and even airplanes, while another student from a village may actually have bicycles, motorized two wheelers or bullock carts and buses in mind. Individual co-construction of knowledge happens on the basis of a student’s unique experiences. 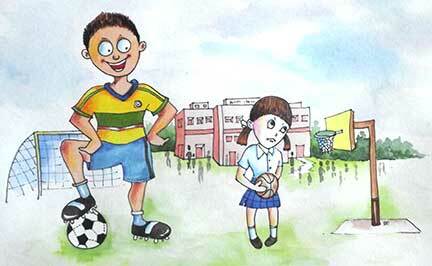 This is what the gender inequality essay that used football as a basis showed. If the essay had been written in response to a content subject question that asked for information on the general inequalities in India with reference to gender, the marking down of the answer would have been acceptable. But this essay was written to show writing ability in English. The content of the essay needs to be perceived only as a medium for the exhibition of language ability. In its wisdom, and with the awareness that some teachers in our country may need a bit of assistance with the evaluation of written responses, boards of education do provide scoring keys to teachers. But these keys should never be seen as prescriptive. In the context of testing writing in the language classroom, scoring keys must serve only as guidelines to teachers, as an indication of the kinds of arguments that students may come up with. If they are used as mandated dogmas that can never be breached, there will be no space left for individual students to use their creativity and capability and write interesting essays. I am sure that there are enough guide books that provide standard answers to this gender inequality question which deal with the three main points that are provided in the key. Expecting students to write only from that perspective is one sure way of killing individuality, thinking, and creativity. Prescriptive keys will ensure that students memorize and reproduce answers: education will get reduced to the mere transmission of knowledge. Today, in the 21st Century, we are clear that education is all about enabling and empowerment. For this to become a reality, it is not enough for these statements to be spouted in prefaces to textbooks. For the philosophy to become a reality, essays that deal with alternative perspectives need to not only be accepted but also valued and celebrated. For this to happen, teachers’ mind-sets have also to change. That may take a long time, but boards of education that provide scoring keys to essay topics in language examinations can go beyond providing such ‘standard keys’. An extra line in all such scoring keys that states that content is only the medium and therefore, while the points listed above are possibilities, teachers should be open to considering alternative perspectives can easily be added.